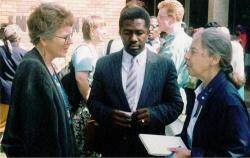 Anti-apartheid activists from around the world came to South Africa to serve as election observers in the period leading up to South Africa's first democratic election on April 27, 1994, including Gail Hovey of American Committee on Africa (ACOA) (left) and Jennifer Davis, Executive Director of ACOA (right). They are pictured here with a local pastor, Robert Mkhwanazi, who served with the Ecumenical Monitoring Programme organized by South African Council of Churches, after an ecumenical prayer meeting in Empangeni, Natal. Used by permission James Knutson.